The French Bonjour Rilakkuma series came out recently. There were plenty of products in store including this set. I went to the Rilakkuma Store at Tokyo Station again yesterday. This time I was in search of a case for my iPhone. 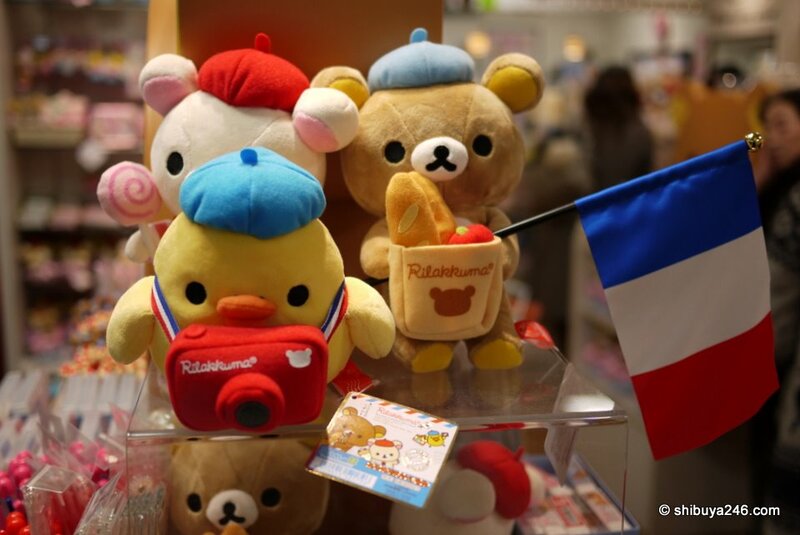 There was lots of activity in store, with the new “Bonjour Rilakkuma” series on display, chocolate magnets and plenty of new Rilakkuma plush designs. The staff were really friendly at the store and said it was ok to take some photos. Rilakkuma is so friendly. Some of these photos were taken with the iPhone, others with the Lumix GF-1. You can click on the menu over the photo to see the camera info. Tiny Rilakkuma plushes all waiting for someone to come and pick them up. The Winter Olympics in on in Canada and Rilakkuma, Korilakkuma and Kiiroitori are putting in their support. Looks like Korilakkuma took the gold medal here. Looks like Rilakkuma might be getting ready to go out into the cold. He has gloves and hat on. Maybe this is a winter edition plush. Rilakkuma workers taking a relaxing break in between shifts. Not sure what the theme was here. Anyone know? Is Rilakkuma popping out of a cake? Maybe this could be a good birthday gift. Rilakkuma Beauty products in store at the moment. Lip treatment, blotting paper, lotion and more. Mixture of designs in these decoration chocolate magnets and straps. These are selling fast at the moment. Kit Kats for Rilakkuma. The Japanese sign is a nice play in words saying "sure to win きっと勝つ kitto katsu. The head bands are traditional with the juken benkyo, entrance exam, study time, and the kit kats might just help students study harder and win! Lots of bags with the Rilakkuma branding on. This one looked especially cute. Special goods to mark the "Bonjour Rilakkuma" French series. The Rilakkuma store apron on this small plush here with a larger Rilakkuma hanging on to a cup holder. Is that a plush balloon that Kiiroitori has in his hand? Rilakkuma decoration chocolates, straps, magnets all very popular. There was so much to see it took me a while to remember to check out the iPhone covers. These are really popular items. iPod and iPhone covers. No doubt someone is probably working on a Rilakkuma cover for the iPad as well ^^. A look at some of the iPhone hard cover cases, earphones, keyholders and other products. In the end I was able to get a black hard case cover. I have some photos of the case when I attached it to my phone. Special promotion on at the Tokyo Station Store right now to celebrate their 1st anniversary. Souvenir pin badges were being giving out to customers who bought more than 2,000 Yen worth of goods. What is your favorite Rilakkuma item here? They look like they are on vacation somewhere on the Mediterranean Coast circa 1970’s ^__^. It’s a “sweets” series from December 2009. WOW. ..It’s like rilakkuma heaven in there. I like the new French series! RT @tweetmeme Rilakkuma Store Visit, Japan character goods http://bit.ly/akhziV What a great looking new selection of my favorite Bear. I just wish they would sell Rilakkuma products in the store s over here. All I’ve ever seen is Hello Kitty things. Need more exposure. They’ve all got that L want one of each factor, especially the olympic set and the ones w the aprons, also the keychain and phone cover and wrist strap. Wow! !, a lot of Rilakkuma. I luv it ^^. that is true. so difficult not to spend money on Rilakkuma ^^. wow~all the photos you post are so cute. looking forward to see more and more about Rilakkuma from you!!! This is amazing rilakkuma goods. give it to me :'(. can you shipping for me? if I pay for you by the ATM. I really like Bonjour set. Please answer me back.